TND – Best of 2011? This is the time of year when everyone comes out with their “Best of Lists” and either my reading material has changed in the past year (entirely possible) or cooking/food has become a much bigger deal (also possible) because I’ve seen more “Best of 2011 Cookbook” lists in the past few weeks than I think I saw in the previous decade. A random, and completely unscientific, sampling of lists (epicurious, Bon Appetit, NPR, the NYT, the Boston Globe, Serious Eats, The Kitchn, David Lebovitz, Kirkus, and The Huffington Post) reveals the following moments of agreement and endorsement. And, in a rare moment of being insync with the zeitgeist I have not only read two of the three books, I wholeheartedly second their endorsement. Plenty by Yotam Ottolenghi is gorgeous and even after you mentally subtract about ¾ cup of olive oil from every recipe, his recipes still sound mouth watering. The Eggplant with Buttermilk Sauce recipe came from that book. Cook This Now by Melissa Clark is currently sitting on my coffee table awaiting return to the library. It’s a lot more down to earth than Ottolenghi, but this lends itself well to a more day-to-day existence. I haven’t made anything for Dinner from it yet, but I’ve made a Swiss Chard and Apricot Bulgur Pilaf for us, and the New Year will bring the arrival of her Coconut Beef Stew spiced with jalapenos and garam masala and cooled down with coconut milk and limes; just reading the recipe makes me hungry. I haven’t read or seen American Flavor by Andrew Carmellini. When Borders went under downtown Boston lost its only bookstore which makes futzing through cookbooks during my lunch hour so much harder these days. I’ve heard of this book – and I’ve heard of the actual Momofuku Milk Bar – and while I certainly wouldn’t object if someone wanted to make me something from it, I don’t bake enough to get all that excited about it. I’m always vaguely annoyed by cookbooks that promise me that they’ll teach me the basic techniques so that I don’t need to rely on recipes. I like recipes. I like seeing what flavors and ingredients other people have paired together, because frequently they’re things I wouldn’t have thought to marry. Also, I like trying out new cuisines and I need recipes to work with when I’m trying out new styles of cooking. Also, and this is petty, but I object to the syntax of his subtitle. Apparently this is a cookbook derived from a restaurant in Montreal. It sounds like fun, although also full of things I’m never likely to cook. This went on my library request list pretty much as soon as I saw the word Morocco. Here’s the thing. I’ve been to Spain three times and never had a good meal while there. On the other hand, outside of Spain I’ve had spectacular Spanish food at both Dali in (the People’s Republic of) Cambridge, and at Solea in Waltham. My conclusion is that I should probably give the cookbook a try, since apparently I do like Spanish food so long as I’m not actually in Spain while I eat it (or I was eating in all the wrong places – also possible). Everyone loves this cookbook. I’m a little eh about it. I’ve flipped through it and not been particularly inspired. On the other hand, SmittenKitchen made a recipe for carnitas from it that I’m pretty sure is already on next year’s Dinner request list, so possibly I should flip through it again. This one I hadn’t heard of, and in light of my recent discovery that I actually quite like Mexican food so long as it isn’t filtered through the kitchens of a Northeast chain restaurant, I clearly need to go add this to my library request list. I’d add an honorable mention for Supernatural Every Day by Heidi Swanson. It only made one of the lists that I looked at, but it was one of the cookbooks I really looked forward to this year and patiently waited to come in for me at the library. It’s where the recipe for the Yogurt Biscuits came from, and is the source of my new favorite ginger cookies (two kinds of ginger + dried apricots + chocolate and then rolled in turbinado sugar before they’re baked). Her blog 101Cookbooks is my go-to source for interesting vegetarian recipes. Then there are the books that are not so much cookbooks, although they frequently include recipes, as they are memoirs. There are always a plethora of these that come out every year. Sometimes they annoy me greatly (see Barbara Kingsolver’s Animal, Vegetable, Miracle), but sometimes they’re a lot of fun. There’s a whole trend in books with the premise of ‘I spent a year doing _____, and here’s my story’ or ‘I lost my job and did ______, and here’s my story’. This is one of the latter, and while usually I run far far away from books like that, this one sounds entertaining, plus it’s all about the calculus of the intersection between taste and cost and convenience when it comes to making food from scratch which is something I’m always thinking about. This is more or less what it sounds like from the title, but it’s gotten really great reviews. Mostly I’m curious because it’s set in France. I can’t quite decide which side of the annoying versus charming line it’s going to fall on for me. I like David Lebovtiz’s The Sweet Life in Paris because it was clear (for me, at least) that he loved living in Paris but this didn’t blind him to the foibles of living in a foreign country and he wrote about it with bemused affection. Unlike, on the other hand, David Sedaris’s ruminations on living in Paris which always make me want to tell him to just move back to New York if he’s going to be that disagreeable about everything. I’m possibly the last person on earth to jump on the bandwagon and be curious about reading this book. This was a birthday Dinner that was entertainingly chosen with the comment that ‘I don’t like three of the main ingredients [ginger, cranberries, squash], but it still sounds super delicious’. I think that in the final analysis she came down on the delicious side of the quandary rather than the disappointing side. At least I hope so. Season the beef with salt and pepper and then brown in a little vegetable oil in batches. Reserve. Either drain most of the oil from the pot, or add a little more if your meat was lean. Add the onions and sauté over medium heat until softened (about 3 minutes). Add the flour and cook, stirring constantly, until golden brown (about 5 minutes). Don’t let it burn. 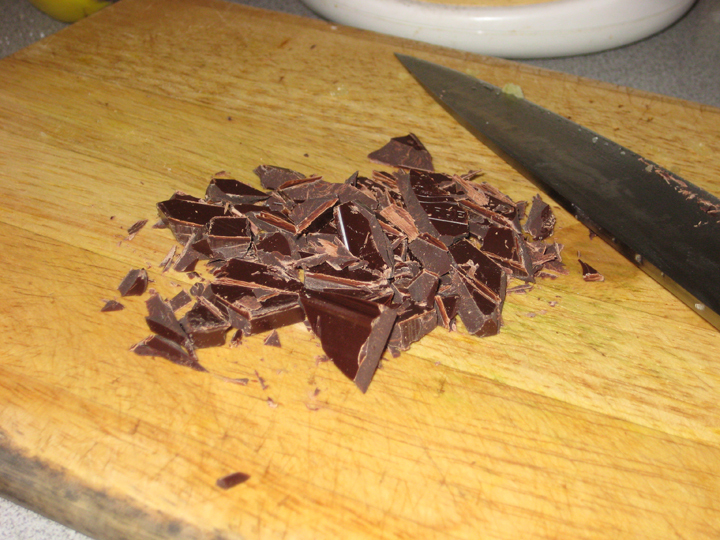 Stir in the garlic and chocolate and cook until fragrant (about 1 minute). Stir in the brandy, and broth, scraping to get up all the fond on the bottom of the pan. 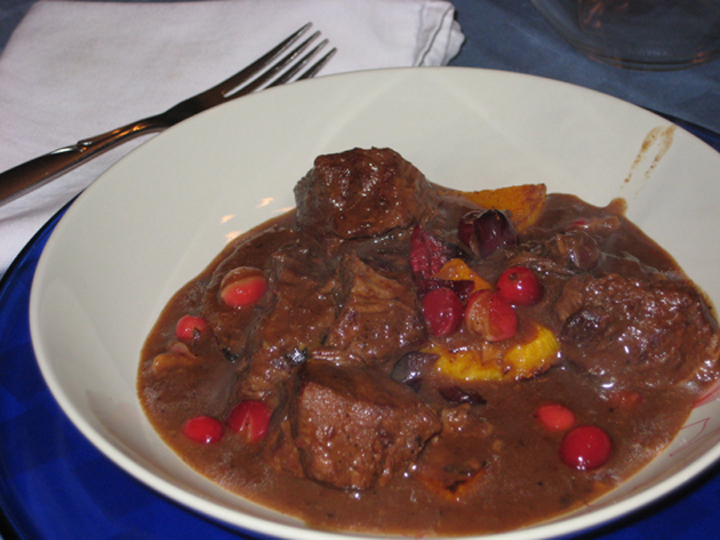 Return the beef to the pot and add the dried cranberries, ginger and orange zest. Bring to a boil, then partially cover and simmer for 1 ½ to 2 hours. Allow to cool to room temperature and chill overnight. Skim off any fat from the top of the stew and bring up to a simmer again. Add the fresh cranberries and cook for about 30-40 minutes, stirring occasionally. While the cranberries are cooking, heat your oven to 375. Toss the squash wedges with salt, pepper and olive oil and roast for 25-30 minutes, turning once, until cooked through and slightly caramelized. Place a number of wedges in the bottom of a wide bowl, ladle the stew over the top and garnish with a few dried cranberries. If you have leftover stew & leftover roasted squash, just add the cooked squash to the stew and reheat all together the next day for lunch. 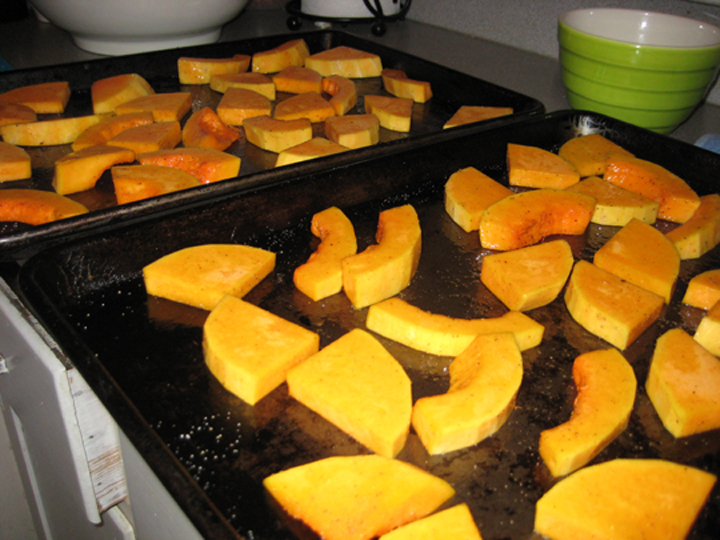 Instead of cutting the squash into wedges, cut it into ¾” cubes. When the stew has returned to a simmer add the cranberries and the squash and cook for 30-40 minutes until the squash is tender. Serve. * The original recipe called for 6 lb of bone-in beef short ribs cut (by your butcher) into 2” lengths. I think that short ribs are (a) over rated, and (b) annoying to both cook and eat, so I made my life easier and substituted regular stew beef. If you want to go the short rib route, you can either cook the meat on the stove top as above, or you can braise it in a 300 oven for about 2 ½ hours. 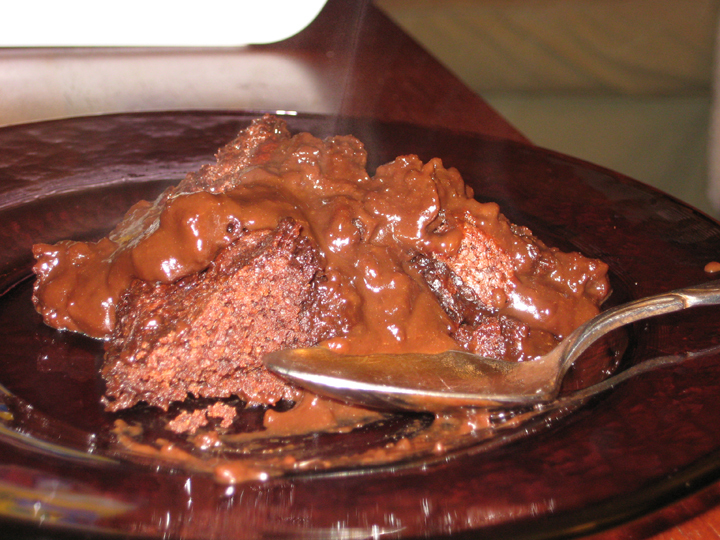 ** I suspect that you could also use 3 Tbsp unsweetened cocoa powder + 1-2 Tbsp honey if you didn’t have any bittersweet chocolate on hand. *** The original recipe called for kachoba squash which I’ve heard tastes kind of like the middle ground between an acorn squash and a pumpkin. I’ve never actually run across one, so I used butternut squash. I’m betting you could use whatever kind of squash you like/have available – acorn, butternut, pumpkin, hubbard, etc. I never cease to be fascinated by this recipe. It looks so unlikely as you put it in the oven, and so crazily delicious when you pull it out. Unsurprisingly, I own Kitchen Confidential and would be happy to bring it with me to Dinner next week.